Parks are popping up in Chicago, Surrey (BC, Canada), NYC, Philadelphia, Vancouver, Dallas, Yarraville (Australia), San Francisco and Minneapolis. What about your city – are you seeing some new green spaces this summer? 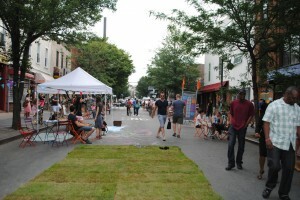 One of the great urban trends of recent years is pop-up parks. They have been happening in San Francisco since 2005. New York has created a number of them – and some of the temporary parks and plazas have been so popular that they are now permanent. 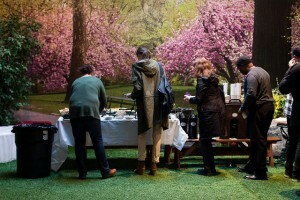 Whimsical, practical, carefully planned or just plain crazy, pop-up parks are a sign of vitality in urban spaces. What we like best is those projects that originate with, or have a very strong input from, citizens on the street. Kids. Seniors. Young adults. Business people. Unemployed folks. In our quest for great urban planning, we sometimes stray too far towards planning and too far away from community. Pop-up parks and other quick-and-dirty pilot projects (seasonal urban gardens, temporary lane closures, parking-lot-to-playground conversions, street events) pump energy and ideas into a city. We need to test and retest those ideas, in practical ways. So what’s happening in your city this summer?